After years of dealing with nighttime seizures, an Illinois man found the relief he sought after Mayo Clinic surgeons precisely mapped the source of his seizures. Evan Bachtold's wife, Rachel, used to be afraid of going to sleep. Lying next to her husband, who had epilepsy, each sound he uttered and every move he made jolted her awake because she feared it might be a seizure. The first time one of Evan's seizures rocketed Rachel from her bed was 2008, just months after the two had wed.
"She'd never seen me do that before and called 911," Evan says. "When I woke up, there were all these EMTs looking at me. I said, 'What are you doing here?' I'll never forget that night." Evan and Rachel, who live with their two children in the hamlet of Strawn, Illinois, embarked on a journey to discover what was causing the seizures. It didn't take much time for Evan's physicians in Bloomington, Illinois, to diagnosis him with temporal lobe epilepsy. But seven years passed before Evan landed at Mayo Clinic and finally found the help required to effectively end the seizures. Under the direction of Mayo Clinic neurosurgeon Fredric Meyer, M.D., and epilepsy specialist Jeffrey Britton, M.D., Evan underwent a two-part cranial surgery in April 2016 to pinpoint the brain tissue causing the seizures and to remove it without causing neurological harm. More than a year later and completely off medications, Evan has not had any seizures. "I think he has an excellent chance of remaining seizure-free," Dr. Britton says. "There's a small chance that some patients will have a recurrence some years after surgery. We certainly hope that won't happen, but the fact that he's gone a year is very encouraging. We're very encouraged and optimistic at this point." When Rachel was first rattled by Evan's nighttime seizure, it was unclear how long Evan, who was 25 at the time, had been experiencing them. When he was 16, he had one daytime seizure he thought was an isolated incident. The episodes that happened while he was sleeping weren't something he was aware of or remembered. 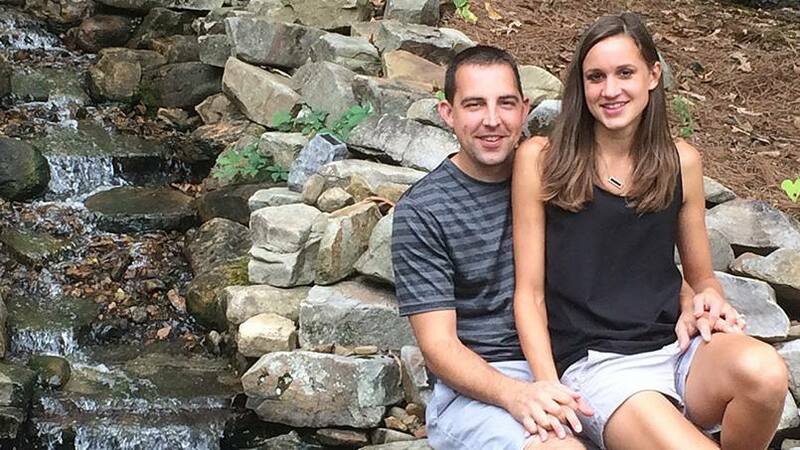 "Before we got married, I didn't have anyone to tell me I was having seizures," Evan says. Rachel, however, was painfully aware of each episode. "I was scared to go sleep, and it was a struggle to stay asleep," Rachel says. "Anytime he would make the slightest noise, my heart would instantly start pounding. It was very scary." Following his diagnosis in Illinois, Evan was placed on anti-seizure medication. But the seizures continued. His physicians added a second medicine to no avail. They tried switching to more powerful medications. Some of the drugs helped for a time, but the seizures inevitably started up again. "I think he has an excellent chance of remaining seizure-free … We're very encouraged and optimistic at this point." — Jeffrey Britton, M.D. "It started to kind of be just the norm," Evan says. "I would have them maybe once or twice a month." Evan, who traveled for his job as a kitchen design and flooring salesman, worried that a seizure would strike while he was on the road. "I always feared that if I had one during the day, I would not be able to drive," he says. Unhappy with the continued seizures and the effect the medicines had on his moods — Evan recalls weeping while talking to a customer one day and later that same night feeling like he was on top of the world — in 2015 he sought advice from a relative who had also been diagnosed with epilepsy. During their conversation, the family member relayed that 15 years earlier she'd had brain surgery at Mayo Clinic's Rochester campus and had an excellent experience. Evan wasted no time requesting that his local physician refer him to Mayo Clinic. At Mayo Clinic's Department of Neurology, Dr. Britton asked Evan about his history and the medications he had tried. "For one in three people with epilepsy, medication doesn't provide complete control," Dr. Britton says. "When we identify someone like that, we know there are eight or nine medications we could try that hadn't been tried before. But we also know the chances that they'll make a big difference is low. Then we start looking for other treatment options, mainly surgery because we know in those patients it may be the only option that can them control over their seizures." To help identify the area of Evan's brain generating the seizures, Evan underwent an MRI. In some cases, an MRI reveals a clear abnormality in the brain and the surgeon can focus on removing that area of the brain. "However, other people have either no abnormality on the MRI or the abnormality has poorly defined borders where we only know roughly where the seizure focus is," Dr. Britton says. "We know the zip code, but not the street address." Evan was one of those cases, Dr. Britton says, adding that in such instances a two-part surgery is necessary to pinpoint the abnormality's exact location. The first part entailed Dr. Meyer surgically implanting an array of electrodes on the brain surface and into specifically targeted deeper regions of the brain. After the procedure, Evan's anti-seizure medications were reduced. Then he and his care team waited for seizures to occur. "The first night, I was hoping I would have one, and I was so disappointed when it didn't happen," Evan says. "The second night I did have one, and the other two happened the next two nights in a row. With those three seizures in just four nights, I wondered how many I'd be having if it weren't for the medication." Prior to the electrodes being implanted, Evan volunteered to undergo a second MRI as part of a research study. That MRI, which was administered the day before the electrodes were placed, revealed a lesion the first MRI did not. "We were fortunate, and it helped us guide the electrode placement a little further," Dr. Britton says. With the results from the brain monitoring and the research MRI, Dr. Britton, Dr. Meyer and their team were able to determine the location of Evan's seizure focus more precisely. The electrodes also mapped brain function adjacent to the suspected source of the seizures. That information enabled Dr. Meyer to surgically remove the portion of Evan's left temporal lobe that gave rise to his epilepsy, without harming his ability to speak, read or remember new information and experiences. "Because the electrode implantation clarified that the seizures started on the outer surface of the temporal lobe and not the hippocampus, we were able to leave the hippocampus behind," Dr. Britton says. "That spared him some of the memory problems that some of our temporal lobe surgery patients might experience." When Evan awoke from his surgery, his head ached and he had some discomfort. It was hard to move for the first two days. But by the third day, he was feeling better, and was able to get up and walk around his room. A few days later, he was discharged from the hospital and returned to Illinois. After he got home, Evan continued taking two of his medications and followed up with his local physician. Side effects from the surgery were minimal, although it did have some minor effects on his short-term memory. But most importantly to Evan, the seizures ceased. And a year after the surgery, he no longer required anti-seizure medication. "I give two thumbs up for Mayo Clinic," he says. "The knowledge they have, and having so many doctors working together for me, was amazing. The doctors, the nurses, everyone is totally welcoming and happy." Check out the Department of Neurology and Department of Neurosurgery. Connect with others talking about epilepsy and seizures on Mayo Clinic Connect.